Sometimes, however, I have very high intentions of eating a few more salads than I actually get around to eating so then comes that inevitable moment when you peek in the fridge and see sad, wilted or even slimy leaves inside. Dang it! Okay, so what's the best way to store salad greens so that they last the longest? An author for one of my favorite websites, thekitchn.com asked readers what their favorite, most effective methods were for storing greens and keeping them fresh for the longest time and these were three of the top methods she tested out. 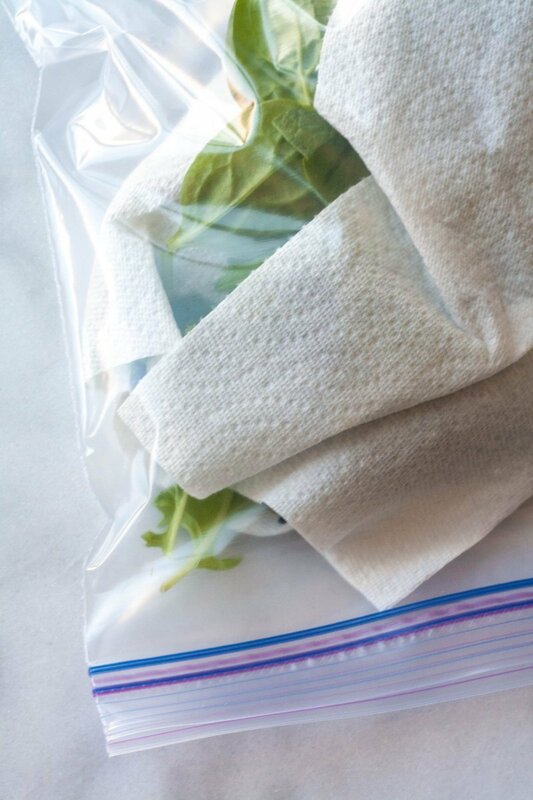 This was a very common method people use is after washing and drying your greens, wrap them in paper towels and put them in a plastic bag (like a Ziploc bag) and get out as much air as possible before you seal it shut. 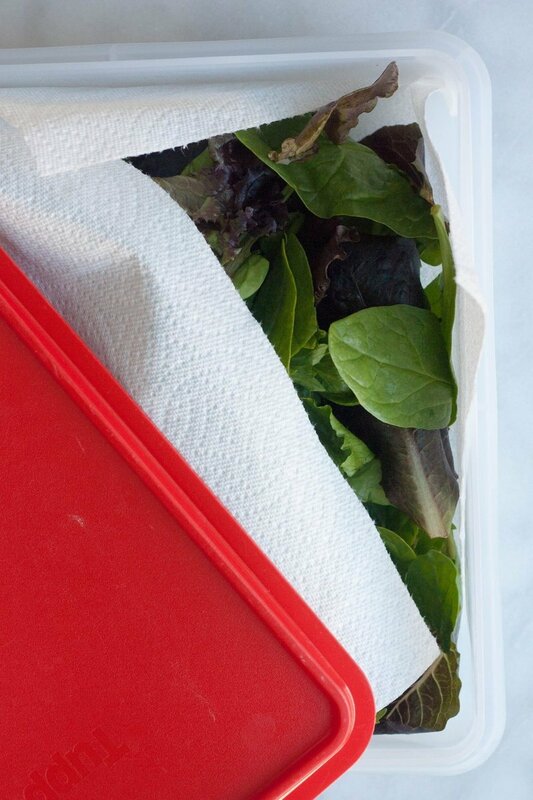 Line the inside of a plastic container with paper towels and place your freshly washed and dried greens into the container. Top it with another paper towel and seal the lid on. 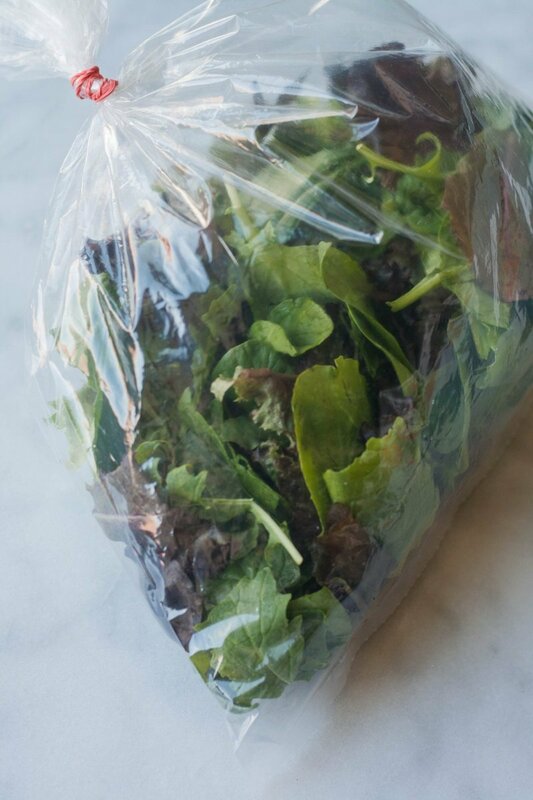 One of her readers suggested to put your greens inside a plastic produce bag, blow a big puff of air into it and seal it. This is supposed to work because blowing air in supposedly provides enough carbon dioxide to keep the greens fresh. She divided up a big batch of greens three ways and put it to the test. After 7 days, they all still looked very fresh and firm. None of them had any wilted or rotten leaves. After 10 days is where things got interesting and this is where the winner was declared. The winner was Method #2: Container with Paper Towels. After 10 days they were still perfectly fresh and none were even wilted. Being able to store tender greens for up to ten days is really convenient and will allow you to buy bigger amounts, saving both time and money since larger bags are usually a better value. The hard sides of the container really protect the greens from getting moved around or crushed like they would be in bags, and the paper towels help to absorb the excess moisture. The other two methods had both wilted and varying degrees of rotten leaves in them. But take note, if you are planning to use your greens within a week, notice that any of the above methods will work great under 7 days and you could save some paper towels. And here is one final tip for how to revive leaves that have already wilted. 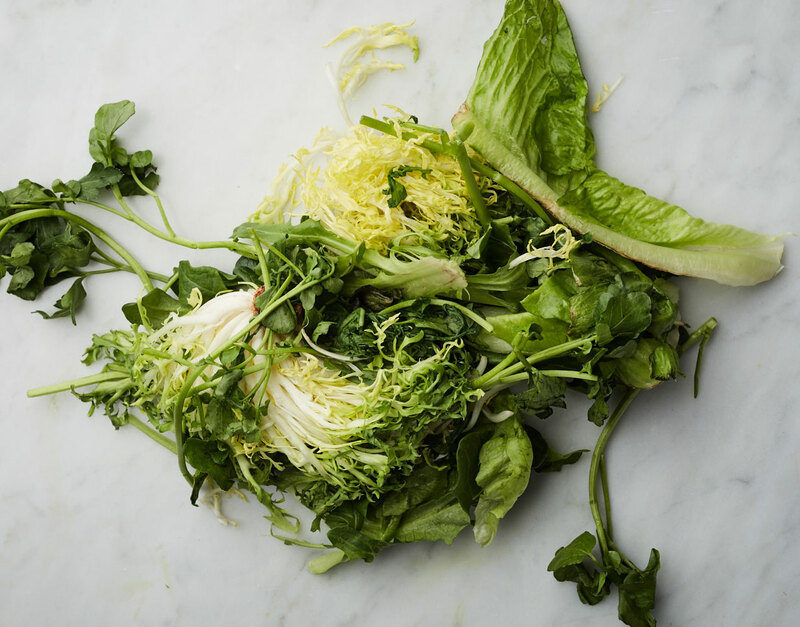 There is hope to bring some life back into that sad, limp salad you’re not thrilled about eating. Take a note from the grocery store and give those leaves a bath! 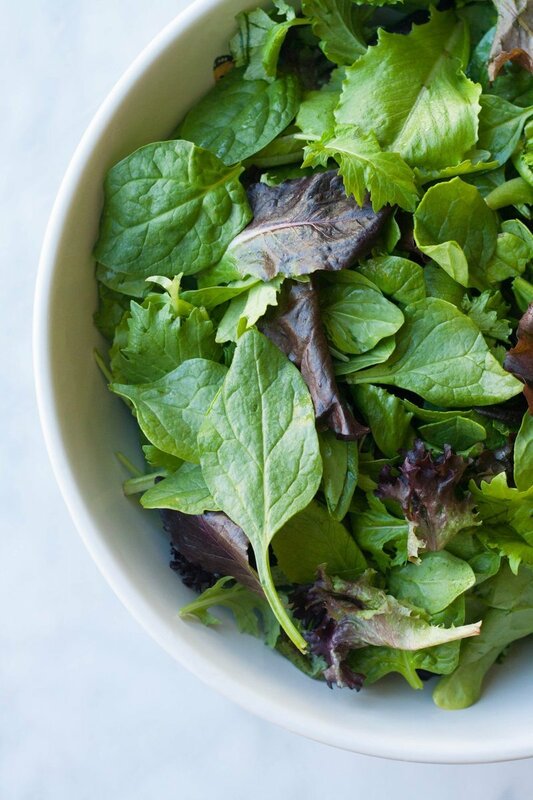 Give those greens a five-minute soak in cool, clean water. Any lackluster leaves will be given a boost and will be good as new. Why does this work? As cut stems are exposed to air, they start to lose the valuable moisture inside their leaves. A quick dip solves that problem and could be the key to getting extra time from those sad, forgotten stems at week's end. Once you're done, run them through a salad spinner or towel/air dry, and return to the refrigerator. Use the leftover water to take care of those houseplants while you're at it! I hope you find these tips to be useful as you store and eat salads and greens in the future! Let me know if you have any other brilliant ideas for keeping salads fresh in the comments below.